We specialize in outdoor picnic tables. 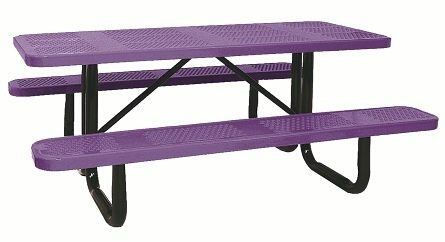 Our outdoor picnic tables are designed for large groups and will stand up to the toughest weather. Our heavy-duty tables are available in two material choices: wood and metal. Both wood and metal table frames are made from galvanized steel and are available in different lengths. A metal outdoor table with a thermoplastic finish will ensure that the table can be used for years to come; it’s the perfect choice for your outdoor area. Metal picnic tables have 11-gauge expanded metal seats and tops, black powder-coated galvanized steel 2 3/8” tubular legs, and come in a wide variety of shades to suit any color scheme. Wooden picnic tables also have 2 3/8” galvanized steel legs and feature high-quality pine seats and tabletops that are easy to assemble and easily replaced, if necessary. All our tables are built for institutional use. Order your outdoor tables online today and improve the quality of your outdoor area!